You get to customize the duration of your data plan. Perhaps you only need the data for a week-long chase vacation, or to monitor a severe weather outbreak over the weekend. We give you the power to choose the plan that is right for you. We have redundant downlink-site level III data/weather feeds directly from the NOAAPort satellite. Our fast, redundant servers produce low-latency updates and reduce outage potential. We have made significant strategic investments to provide you with great solutions at very attractive price points. Some of the data provided by Caprock Weather may be obtained from internet-based servers that are not under the control of Caprock Weather. Caprock Weather makes no guarentee of timeliness or accuracy of this data. Any data obtained from Caprock Weather is not intended to be used in conjunction with efforts to maintain safety of life and/or property. 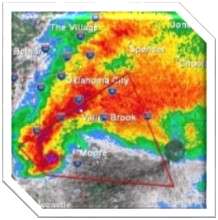 In no event will Caprockweather be liable to you or to any third party for any direct, in direct, incidental, consequential, special or exemplary damages, injury or death resulting from any use or misuse of data provided by Caprockweather. A Caprock Weather subscription is license to acquire the provided data during the alloted subscription time. The users are not authorized to resell and/or redistribute the data in any form including derived works. Occasional, non-automated screen-shots of the data, however, are permitted. No guarantee of uptime is provided with a subscription though we have proven track of high reliability. If you want a guarantee, we'll be happy to refer you to provider which offers such a service. Of course, the rates will be at least 100x what you pay here. Each data subscription is intended for a single access instance. Customers may switch computers, such as from a home pc to a mobile device, but are not authorized to run more than two copies of the subscription at the same time. If additional concurrent sessions are required, please contact support@caprockweather.com for further detail. Caprock Weather reserves the right to cancel service at any time. If inappropriate activity is detected, the customer&apos;s account may be suspended without prior notification. 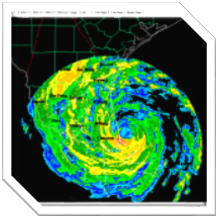 Caprock Weather is a weather data provider for use in a wide variety of applications. 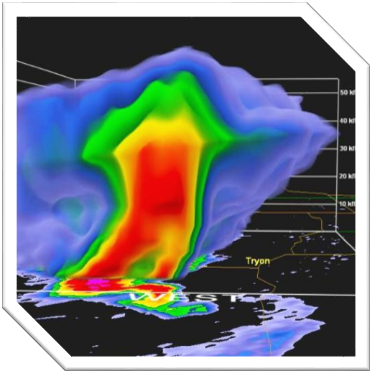 Our specialty is high-resolution data for the weather enthusiast and severe weather monitoring community.